How do you identify honeybees, bumblebees, solitary bees, wasps and the many flies which can look like bees? All bees are essential to our well-being. We cannot live without bees pollinating our fruit vegetables and the seeds and fruits, which birds and animals eat. We need to protect them at all cost or world supplies of food will diminish. If the insects are left alone they will not harm you. Bees only sting in self defence and will die if they do have to sting you. Are they quite large furry and rounded? Are they going in the ground or low down in something like a compost bin? Or in a bird nestbox? Are there only about 5 or 6 seen at any one time? Bird nest boxes may have more. They have small nest about fist size. Once established the Queen bee stays inside and lays eggs whilst smaller bumble bees begin to forage for nectar and pollen. They are loath to sting but bump into things as they are bad flyers. They will all die in the autumn except for a few new Queens who will go away and hibernate until next spring. They do not return to the same nest. 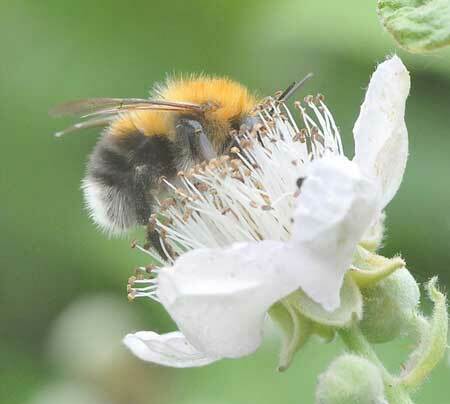 Bumblebees are protected and do so much good in the garden by pollinating plants. There are around 24 species of bumblebee in the UK, several of them are widespread and common such as the larger Bombus terrestris. You can find more information here. Why not watch them at work and see what colour pollen they are returning with? A bumblebee which has been spreading in England in recent years is the Tree Bumblebee, Bombus hypnorum. They have distinctive white tails and furry ginger backs. They nest higher than other bumblebees and often use old bird boxes. When the next generation of queens are ready to emerge, a number of drones can often be seen flying around the entrance waiting for them. The amount of activity can catch attention, but the drones don't sting and their interest is in the other bees. Like any other bumblebees, the nest will be abandoned in a month or two. Tree bumblebees are attracted by nest boxes with old nests, if the box is cleaned out after the birds have finished with it bumblebees are far less likely to use it. Are they small and mostly brown? Are there 20 or more seen at any one time flying in and out of a small hole? Have they just appeared in the late spring? They could have arrived as a swarm and taken up residence in your property as natural nest sites like old trees are being removed. They cannot survive for more than a season now as they are suffering from a mite and virus problem, which will cause them to die during winter. Honey bees are the only bees which remain in a colony nest over winter. They gather nectar and store it as honey to feed them through the cold period. By careful management they can be persuaded to gather more than they need themselves and beekeepers harvest the surplus. They are much needed and could be collected by beekeepers, but if inside a wall cavity this is impossible. If you find a large mass of bees hanging on a branch or clinging to a fence post this may be a swarm of bees and could be removed by a beekeeper. For more information on what to do with a swarm look here. Is there an area of lawn or brick wall where there are insects flying? Are they small and only about 3 or 4 seen at any one time? Are there lots of little holes in the lawn or wall? There are about 200 different solitary bees in the UK and this may be one of these. Below are male and female Red Mason Bees. You can provide a home for them in your garden with a bee house from a garden centre or one you make yourself with a bundle of canes, tubes or holes drilled in wood. Are they yellow and black striped? Do they fly in zig-zag way and very quickly? Can you see a paper nest like a football size and shape? A queen wasp will make a paper nest from chewed wood fibres in a roof space, garden shed or sometimes a thick hedge in May. You will probably not see her as she quietly works. Wasps are carnivores and will help the gardener remove caterpillars and bugs which they use as food, but in August they turn to needing sugar and can become a nuisance. This is when you will first encounter wasp problems. There are two species of yellow and black wasps in the UK that make large paper nests. They make these nests only over the summer. In winter the queens hide away and hibernate before making a new nest in spring. They do not re-use their paper nests so if a nest is found late in the year and is not causing a problem it can be left to empty over winter. Although these brightly-coloured insects look like bees or wasps, they are in fact true flies and do not sting. These are excellent examples of Batesian mimicry (named after H W Bates who first described it in 1862). Bees and wasps are insects that sting and also taste unpleasant, so the flies which mimic them are also avoided by predators. Bombylius major, is the largest and best known of the British species of Bee Fly. The body is stout and furry, so that the fly has a strong superficial resemblance to a bumblebee, although the long, spindly legs are rather different from those of a bee. There are over 200 species of hover fly recorded in the UK. In this species the female enters the paper nests of wasps and lays her eggs. The hosts do not appear to register her presence as she makes her way into the nest entrance, the impersonation of wasps is more than just appearance. Drone-flies are a sub class of hover flies that mimic honey bees, like bees the adults visit flowers and contribute to pollination. There are several related species mimicking bumblebees, such as Volucella bombylans.